Teenage Murderer Says He Loves Violent Video Games. NBC Thinks There's A Connection. Last week, 15-year-old Nehemiah Griego killed his entire family: both parents and three siblings. He confessed to the crime, saying he did it because he was frustrated with his mother. And he got really excited to discuss violent video games with the police, according to an NBC report. 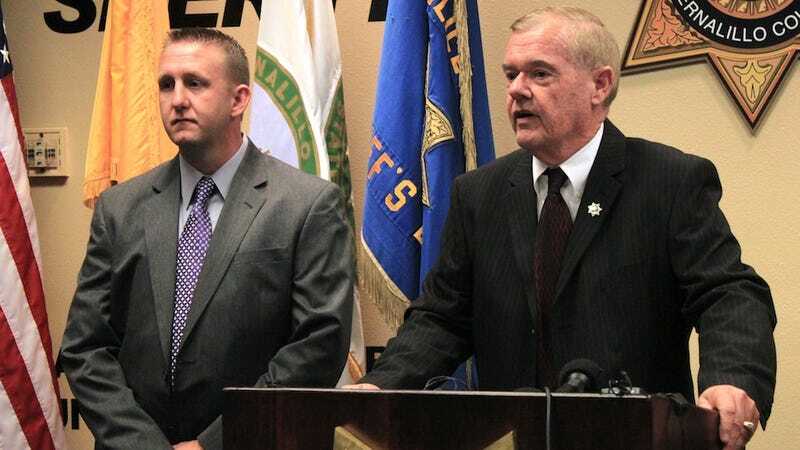 "It was kind of what he was into and was quite excited as he got the opportunity to discuss that with investigators," said Dan Houston (pictured on right), sheriff of Bernalilo County, New Mexico, where the murders took place. Houston specifically cited Grand Theft Auto and "Modern Warfare," which inevitably led reports like NBC's to draw a connection between his horrific crime and violent video games. A 15-year-old New Mexico boy was "involved heavily in violent games" before he plotted and carried out the massacre of his parents and three siblings because he was "frustrated" with his mother, police said Tuesday. Nehemiah Griego did not elaborate on a motive for the shocking crime, but he had plenty to say about his love for video games, including "Modern Warfare" and "Grand Theft Auto," authorities said. Just look at that sentence. "Nehemiah Griego did not elaborate on a motive for the shocking crime, but he had plenty to say about his love for video games"—as if there's some connection between his motive for killing his entire family and his love for video games. Though there's no scientific evidence that shows any link between video games and violence, some media reports continue to imply—and in some cases, directly say—that there is.